204 pages | 10 B/W Illus. Exit from Globalization moves from theory to practice: from questions of where incorrigible knowledge of substantive economic life derives and how that knowledge is put towards making a progressive, redistributive, eco-sustainable future of human flourishing. Westra discards at the outset views that the root of current economic ills is the old devil we know, capitalism. Rather, he maintains the neoliberal decades spawned a "Merchant of Venice" economic excrescence bent upon expropriation and rent seeking which will scrape all the flesh from the bones of humanity if not stopped dead in its tracks. En route to providing a viable design for the human future in line with transformatory demands of socialists and Greens, Westra exorcizes both Soviet demons and ghosts of neoliberal ideologues past which lent support to the position that there is no alternative to "the market". 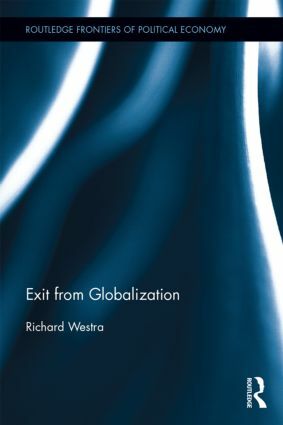 Exit from Globalization shows in a clear and compelling fashion that while debates over the possibility of another, potentially socialist, world swirl around this or that grand society-wide scheme, the fact is that creative future directed thinking has at its disposal several economic principles that transformatory actors may choose from and combine in various ways to remake human economic life. The book concludes with an examination of the various social constituencies currently supporting radical change and explores the narrowing pathways to bring change about. Richard Westra received his PhD from Queen’s University, Canada. His current appointment is Designated Professor at the Graduate School of Law, Nagoya University, Japan. Among his numerous international publications he authored The Evil Axis of Finance, Clarity Press, 2012 and co-edited The Future of Capitalism After the Financial Crisis, Routledge, 2015.